I have a habit – as many avid readers do – of reading more than one book at a time. (I had better not look at the number of books under currently reading at Goodreads I might get discouraged by the number since I am sure I am reading at least two more I have not gotten around to putting up there.) This used to be my advantage but lately I have been frustrated by the habit. Switching worlds has become something I am suddenly aware of. I forget my audio book and do not have the same title in my Kindle and I get annoyed. Maybe it’s my preference for short stories that’s doing me in, it does require more world switching than reading a novel series. I have not been working more lately. Less, I think. And yet I feel I am lagging behind on my reading. All of this would probably not matter to me so much, but it is a really lovely true autumn day in Zagreb today. I know most books get sold and read during the summer, but for me autumn days were made for reading. 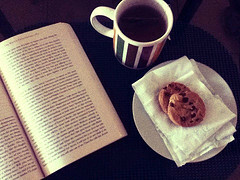 Tea, a good book and an overcast day. My favourite time to read. I think I might go book-hop for a while now. PreviousFree Croatian SF Fiction: Parsek 125 is online! NextThe FFANZ race is on!